What began as a patch of grass has become a fantastic new sports facility for the community of Springvale South, Victoria. 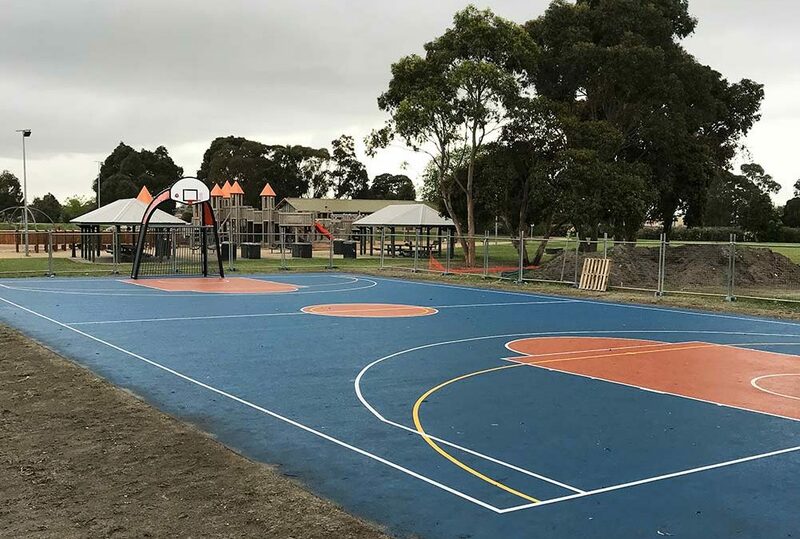 The Council of the City of Dandenong contracted Dynamic Sports Facilities to construct this multi sport court at Burden Park for use by the public. It is situated alongside an existing children’s play area and picnic area, and is becoming very popular with the locals. The court has line markings and equipment for futsal and basketball. 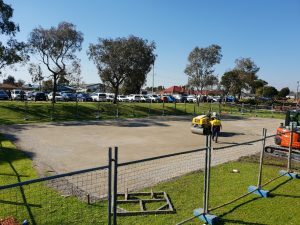 The Dynamic Sports Facilities team began this project by excavating and preparing the subgrade, then poured a 125mm thick concrete slab with mesh reinforcement. This received 3 coats of low slip ‘Plexipave’ acrylic surfacing in ‘Australian Open Velocity Blue’ with ‘Outback Clay’ in the basketball keys and centre circle to compliment the similarly coloured playground equipment alongside the court. ‘Blade Recreation’ futsal and basketball towers were installed, which are a fantastic combination of a basketball hoop and futsal cage/goal, and come in heavy-duty materials, ideal for all weather situations. The brand new facility was handed over to Dandenong Council who said they were ‘over the moon’ with the court. Here at Dynamic Sports Facilities we love helping communities GET ACTIVE by creating modern and beautiful sports facilities.